This series of articles was originally published online by The Estate Planning for Pets Foundation, copyright © 2003. The Foundation appears to be now defunct and the website where these articles were published is now owned by a private legal firm in southern California. 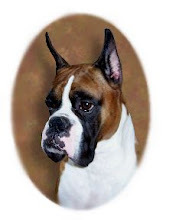 The articles were reprinted with permission in the Michigan Boxer Club newsletter, The ChatterBoxer, from June - August 2004 and are being revived here, with a few updates to applicable tax issues and website links, under that same reprint permission. This sample language below is intended for illustrative purposes only and should not be used or otherwise relied upon in drafting legal documents without accompanying legal advice and making necessary changes to appropriately integrate such sample language with the other provisions of the applicable legal document. Language similar to the following could be used in the dispositive provisions of a pet owner's will or revocable living trust. As an alternative to specifically naming the pet (as provided above), the drafter could simply refer to "my pets" and define the term to include all the pets owned by the testator at the time of the testator's death. This approach takes into account the fact that the testator may have a different group of pets at the time of his or her death. The assumption behind this language is that the pet owner does not desire to make a gift subject to a condition subsequent, whereby the beneficiary would be entitled to the caretaking funds even if the pet does not survive the pet owner. Many pet trust statutes provide that language in a will may be liberally construed to impose a statutory pet trust upon the beneficiary. This language counters the application of such a statute. A. Trustee. [NAME OF INITIAL TRUSTEE] shall serve as initial Trustee; but in the event that [NAME OF INITIAL TRUSTEE] is unable or unwilling to serve, [NAME OF SUCCESSOR TRUSTEE] shall serve as successor Trustee. In the event that both of the above-named parties are unable or unwilling to serve, the successor Trustee shall be appointed by the [NAME OF ENFORCER], if she is unable or unwilling to do so, by a court of competent jurisdiction. The Trustee may resign upon by providing 30 days’ written notice thereof and possession of [NAME OF PET] to [NAME OF ENFORCER] or any other party appointed by the court to enforce this Trust. The Trustee may be removed, at any time, by the [NAME OF ENFORCER] or by a court of competent jurisdiction, and upon receipt of written notice of removal, the Trustee shall relinquish possession of [NAME OF PET] and the remaining assets of the Trust to the duly-appointed successor Trustee, or if there is no such party, to [NAME OF ENFORCER]. Notwithstanding the foregoing, in no event shall [NAME OF ENFORCER] or any other party appointed by the court to enforce this Trust serve as Trustee. Except as otherwise provided herein, the Trustee shall have all the rights, powers, duties, and obligations of a trustee under applicable law. C. Termination and Final Distribution. The Trust shall terminate upon the earlier of the following: (a) the net value of the Trust assets (other than [NAME OF PET]) decreases to less than $_______;  or (b) the death of [NAME OF PET]. If termination of the Trust occurs because of the death of [NAME OF PET], the Trustee shall, at the expense of the Trust, provide for the respectful and proper disposition of the remains of [NAME OF PET], pay any remaining debts and expenses of the Trust, and then distribute the remaining assets of the Trust to [NAME OF REMAINDER BENEFICIARY] OPTION FOR CHARITABLE BENEFICIARIES: “; provided, however, that if [NAME OF REMAINDER BENEFICIARY] does not then qualify as an organization exempt from federal income taxes under Section 501(c)(3) of the Internal Revenue Code, then the Trustee shall select an appropriate tax-exempt organization that provides for the care of similar pets to receive such distribution"]. If termination occurs for any other reason, the Trustee shall distribute the remaining assets of the Trust to the Trustee, who shall hold such assets outright and free of trust, but conditioned on providing for the continued health, welfare, and care of [NAME OF PET]. D. Enforcement of Trust by Third Party. The purposes and terms of this Trust may be enforced, at any time, with or without court intervention, by [NAME OF ENFORCER], or if [NAME OF ENFORCER] is unable or unwilling to do so, by any party appointed by a court pursuant to [CITATION TO PET TRUST STATUTE]. To this end, [NAME OF ENFORCER] may (but is not required to) request an accounting for the funds of the Trust, not more frequently than quarterly, and inspect [NAME OF PET] and the conditions of the premises where [NAME OF PET] is kept, from time to time, to ensure that appropriate care is being provided by the Trustee. This provision shall apply even if the party granted enforcement powers is not a beneficiary of the Trust. Notwithstanding the foregoing, no provision in this paragraph shall be construed to limit the rights of the Trustee and the beneficiaries to enforce the terms hereof. E. Purposes. While [NAME OF PET] is alive, the primary purpose of the Trust is to provide for the health, care, and welfare of [NAME OF PET]. Notwithstanding, if at any time, [NAME OF PET] suffers from a medical or physical condition or illness and the Trustee determines, based on a written opinion of a veterinary professional who has examined [NAME OF PET], that it would be more humane to euthanize [NAME OF PET], then the Trustee is authorized to do so at the expense of the Trust. F. Spendthrift Provision. As a material purpose of the Trust, the interest of any beneficiary in the net income or principal shall not be subject to the claims of any creditor, any spouse for alimony or support, or others, or to legal process, and may not be voluntarily or involuntarily alienated or encumbered. Except as otherwise provided, no beneficiary’s interest shall be subject to anticipation, assignment, sale or transfer in any manner, nor shall any beneficiary have the power to anticipate, alienate, encumber or charge such interest, voluntarily or involuntarily, nor shall such interest be liable for or subject to the debts, obligations, liabilities, torts or contracts of any beneficiary. G. Applicable Law. This Trust is established by the Settlor and accepted by the Trustee under the laws of the State of [NAME OF STATE], and in particular, [CITATION TO PET TRUST STATUTE], and all questions concerning its validity and construction shall be determined under [NAME OF STATE] law, regardless of any change in the situs of the Trust. As an alternative to specifically naming the pet throughout the Trust (as provided above), the drafter could simply refer to the "Settlor's pets" and define the term to include all the pets owned by the Settlor at the time of the Settlor's death. This approach takes into account the fact that the Settlor may have a different group of pets at the time of his or her death. The trustee succession provisions may be drafted in a number of different ways. In addition, the applicable pet trust statute may allow a court to designate a successor trustee of a pet trust. In a statutory pet trust, the trustee has control over the pet and the funds, so at a minimum, the third-party enforcer should be able to remove the trustee without court intervention if necessary. As drafted, the above clause gives the third-party enforcer broad authority to do so, although such authority could be limited to removal for cause. Even if it is possible under the statute, the whole reason for creating a pet trust dictates that the trustee and the third-party enforcer should never be the same person. This provisions defines how the funds of the pet trust are to be used, and in doing so, attempts to balance the needs for detail in instruction with flexibility in execution. As discussed in the outline, it is unclear how a statutory pet trust would be taxed in this situation. In any event, this clause ensures that any taxes paid by the trustee will be reimbursed from the trust funds. This clause is entirely optional. In a perfect world, as a matter of incentives, the pet-owner would prefer to choose a caretaker who would be willing to care for the pet without compensation. It is assumed that, when the value of the funds falls under a certain amount (e.g., $1,000), it would no longer be cost-effective to keep the pet trust intact. In the alternative, this clause could provide for the “exhaustion of trust assets”. The enforcement of the trust by a non-beneficiary is one of the legal obstacles to creating a legal trust for the benefit of a pet that is intended to be addressed by the pet trust statute. See A.R.S. §14-2907(4). This clause is intended to define the third-party enforcer and certain rights that are essential to that function. However, as encountered with provisions trust protectors, the question remains as to whether such a third party has fiduciary duties associated with the rights to enforce the pet trust. The degree of importance of the purposes of the pet trust should be expressly stated, especially considering its unorthodox nature. Given the nature of the pet trust, the issue of euthanasia should be expressly discussed in the terms of the Trust. This provision is intended to protect the assets of the Trust form the creditors of the Trustee and the beneficiaries. A. Trustee. [NAME OF INITIAL TRUSTEE] shall serve as initial Trustee; but in the event that [NAME OF INITIAL TRUSTEE] is unable or unwilling to serve, [NAME OF SUCCESSOR TRUSTEE] shall serve as successor Trustee. In the event that the above-named parties are unable or unwilling to serve, the successor Trustee shall be appointed by: (i) the written designation of previous Trustee (who has not been removed) delivered to the Caretaker Beneficiary and the Remainder Beneficiary; or (ii) if the previous Trustee does not make such a designation, the unanimous written designation of the Caretaker Beneficiary and the Remainder Beneficiary; or (iii) if such parties do not make such a designation, by a court of competent jurisdiction. Notwithstanding the foregoing, in no event shall the Caretaker Beneficiary serve as Trustee. The Trustee may resign, at any time, by providing 30 days’ written notice to the Caretaker Beneficiary and the Remainder Beneficiary. Except as otherwise provided herein, the Trustee shall have all the rights, powers, duties, and obligations of a trustee under applicable law, and in addition, may (but is not required to) inspect [NAME OF PET] and the conditions of the premises where [NAME OF PET] is kept, from time to time, to ensure that appropriate care is being provided by the Caretaker Beneficiary, as provided below. B. Caretaker Beneficiary. [NAME OF INITIAL CARETAKER] shall be the initial “Caretaker Beneficiary”, but if [NAME OF INITIAL CARETAKER] is unable or unwilling to receive the benefits and meet the conditions set forth herein, then [NAME OF SUCCESSOR CARETAKER] shall be the successor Caretaker Beneficiary. Before any initial distribution is made, any party with an interest as Caretaker Beneficiary shall be informed of the conditions for possession of [NAME OF PET] and receipt of funds hereunder. If any party who is entitled to distributions as Caretaker Beneficiary is, in the sole discretion of the Trustee, unable or unwilling to provide sufficient care for [NAME OF PET] or the Trust’s ownership of [NAME OF PET] is jeopardized, then the Trustee may, without court intervention, acquire possession of [NAME OF PET] from such party, divest that party of any interest as Caretaker Beneficiary, and appoint another party as successor Caretaker Beneficiary who is willing and able to provide sufficient care for [NAME OF PET]. Notwithstanding any other provision herein, in no event may the Trustee, the Trustee’s estate, the creditors of the Trustee, or the creditors of the Trustee’s estate be the Caretaker Beneficiary. C. Distributions and Possession of Trust Property. During the term of the Trust, the Trustee shall distribute to, or for the benefit of, the Caretaker Beneficiary such amounts of net income, and if necessary, principal, as the Trustee determines to be necessary or advisable for the health, care, and welfare of [NAME OF PET], including (but not limited to) food, veterinary care and/or insurance, toys and other recreational activities, and temporary boarding and/or pet-sitting fees. In exercising such discretion, it is intended that the Trustee will maintain [NAME OF PET] in the same standard of health, care, and welfare as the Settlor. The Trustee is also authorized to pay, or reimburse to the Caretaker Beneficiary for, any income taxes attributable to the Trust and other necessary expenses associated with the administration and distribution thereof. [OPTION: In addition to the foregoing, the Trustee is authorized to pay: (1) to the Caretaker Beneficiary, compensation in the amount of $______ per year; and (2) to the Trustee, compensation in the amount of $______ per year.] In any event, the Caretaker Beneficiary shall be entitled to possession of [NAME OF PET] for so long as he or she is providing for such care for [NAME OF PET] and the Trust’s continued ownership of [NAME OF PET] is not jeopardized. D. Termination and Final Distribution. The Trust shall terminate upon the earlier of the following: (a) the net value of the Trust assets (other than [NAME OF PET]) decreases to less than $_________; (b) the death of [NAME OF PET]; or (c) 21 years after the death of the last heir of the Settlor’s grandparents who is living at the time this Trust is established. If termination of the Trust occurs because of the death of [NAME OF PET], the Trustee shall, at the expense of the Trust, provide for the respectful and proper disposition of the remains of [NAME OF PET], pay any remaining debts and expenses of the Trust, and then distribute the remaining assets of the Trust to [NAME OF REMAINDER BENEFICIARY], the “Remainder Beneficiary” [OPTION FOR CHARITABLE BENEFICIARIES: “; provided, however, that if [NAME OF REMAINDER BENEFICIARY] does not then qualify as an organization exempt from federal income taxes under Section 501(c)(3) of the Internal Revenue Code, then the Trustee shall select an appropriate tax-exempt organization that provides for the care of similar pets to receive such distribution”]. If termination occurs for any other reason, the Trustee shall distribute the remaining assets to either the Caretaker Beneficiary and/or the Remainder Beneficiary, as the Trustee determines to be most consistent with the intent of the Trust. E. Purposes. While [NAME OF PET] is alive, the primary purpose of this Trust is to provide funds to the Caretaker Beneficiary for the health, care, and welfare of [NAME OF PET]. Notwithstanding, if, at any time, [NAME OF PET] suffers from a medical or physical condition or illness and the Trustee or the Caretaker Beneficiary determine, based on a written opinion of a veterinary professional who has examined [NAME OF PET], that it would be more humane to euthanize [NAME OF PET], then either the Trustee and/or the Caretaker Beneficiary is authorized to do so without court intervention. The Trustee succession provisions may be drafted in a number of different ways. Nonetheless, in accordance with the practical purposes of the Trust, the Trustee and the Caretaker Beneficiary should never be the same party. It is assumed that, when the value of the funds falls under a certain amount (e.g., $1,000), it would no longer be cost-effective to keep the Trust in tact. In the alternative, this clause could provide for the “exhaustion of trust assets”. One of the roadblocks to a trust intended to benefit a pet for life is that the duration does not technically fall within the appropriate common law or statutory perpetuities period, which must often be based on a human life in being at the time the trust is created. This clause is an example of a common law perpetuities savings clause, although the clause should always be tailored to the particular situation. For example, the above clause would not be of much use if the Settlor has no family. In this case, the clause could invoke the applicable statutory perpetuities period – e.g., in Arizona, 90 years after establishment of the Trust (A.R.S. §14- 2901(A)(2)). This optional clause gives flexibility in the event that a charitable beneficiary is not in existence at the time of termination of the trust. The clause assumes that the Settlor would want the remaining funds to pass to an organization that cares for the same type of pet that the Settlor had, although this need not necessarily be the case. In general, the Trust would terminate early due to a lack of funds, and the question becomes who should receive the pet and/or the funds. The above language leaves the decision up to the Trustee. Note that if the Trustee was also the Caretaker Beneficiary, however, this clause would likely be considered a general power of appointment for tax purposes, although the value of the property subject to the power would presumably be limited. The degree of importance of the purposes of the trust should be expressly stated, especially considering its unorthodox nature. Given the nature of the pet trust, the issue of euthanasia should be expressly discussed within the terms of the Trust. If the drafter is preparing a document in a state that has a pet trust statute, this provision could be added to make clear that such statute, and all its special restrictions, is not to be applied. Language similar to the following could be used in a durable power of attorney (or revocable living trust). In the event that the Principal is unable to provide for the care of [his/her] pet, [NAME OF PET], [DESCRIPTION OF PET], the Agent is authorized to: (1) take possession and custody of the pet [OPTION: or provide possession and custody of the pet to the Trustee of the [NAME OF REVOCABLE LIVING TRUST]]; and (2) expend or otherwise utilize such amounts of the Principal’s funds or other property as may be necessary or advisable to provide for the health, care, and welfare of the pet, including (but not limited to) food, veterinary care and/or insurance, toys and other recreational activities, and temporary boarding and/or pet-sitting fees. In exercising such authority, it is intended that the Agent will maintain [NAME OF PET] in the same standard of health, care, and welfare as the Principal. [OPTIONAL: Unless medically or physically impracticable, the Agent shall permit the Principal to have as much contact with [NAME OF PET] as the Principal did before becoming incapacitated.] For the purposes of this instrument, any such actions by the Agent taken for the benefit of the Principal’s pet shall be considered taken for the benefit of the Principal. This language could also be modified for placement in a revocable living trust, where the “Principal” is the settlor and the “Agent” is the successor trustee. However, it would be effective only if the pet animal actually becomes property of the trust. As an alternative to specifically naming the pet (as provided above), the drafter could simply refer to the "Principal’s pets" and define the term to include all the pets owned by the Principal at the time of the Principal’s incapacity. This approach takes into account the fact that the Principal may have a different group of pets at the time of his or her death.